Performance Longboards are designed to offer the surfer progressive turns, trim, and nose riding in one versatile surfboard. Rocker and profile have curves that fit and trim tight in the pocket and on the open face. 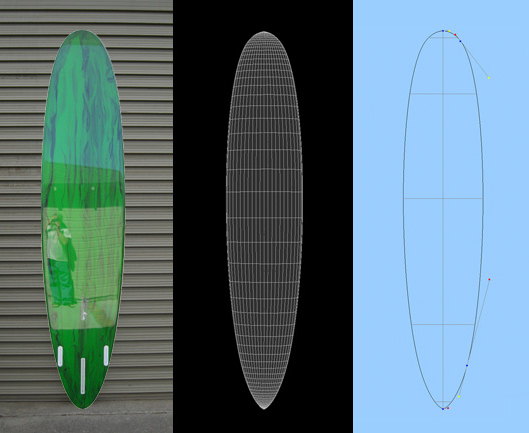 Outlines are marginally narrower than traditional long boards and feature a narrower nose and tail. These boards have the same proven convex bottom contours found in many Natural Curves designs - subtle tri plane entry transitions to a panel vee (with no acute transition where the vee panels merge at the stringer.) Rails are neutral nose to wide point and low in the tail. Lighter foam density and glassing schedule contribute to a more sensitive feel than their classic predecessor. Dimensions: 9' 2" x 22 1/4" x 3"